Another Friday is upon us! Got anything cooking? About the only thing I currently have planned is spending some time with a friend of mine that is visiting from Japan, where he teaches English. I used to work with him at my last photo lab job and even back then he was committed to moving to Japan upon graduating from college. And I’ll be damned if he didn’t do just that. So congrats, Dave. Not many of us do what we say, and I’m completely jealous. I had requested that he bring all of us a little something from Japan to which he obliged, so who knows what we’ll end up with. (C’mon, Mr. Sparkle box…) And since he’s also a gamer, chances are the night he visits will be Game Night. Should be fun. There are no other concrete plans for this weekend, save for possibly posting a few entries at my other blog, which seems to be getting more and more neglected lately. Actually, aside from the Weekly Weigh-Ins, there hasn’t been much to say. But I thought I’d better tend to it soon–I heard it whimpering the other night as if somebody kicked it in the nuts. That’s about all I gots for now. Make it a safe weekend and see you here again on Monday! This entry was posted in Life, Weekend Plans and tagged engrish, mr. sparkle by Dave. Bookmark the permalink. 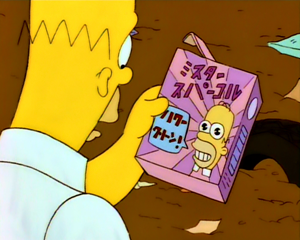 A Mr. Sparkle box would be super amazing terrific! I would have very lucky dishes!